On a rare occasion, the notary public may be asked to notarize the signature of a person who cannot sign a document in the usual manner. 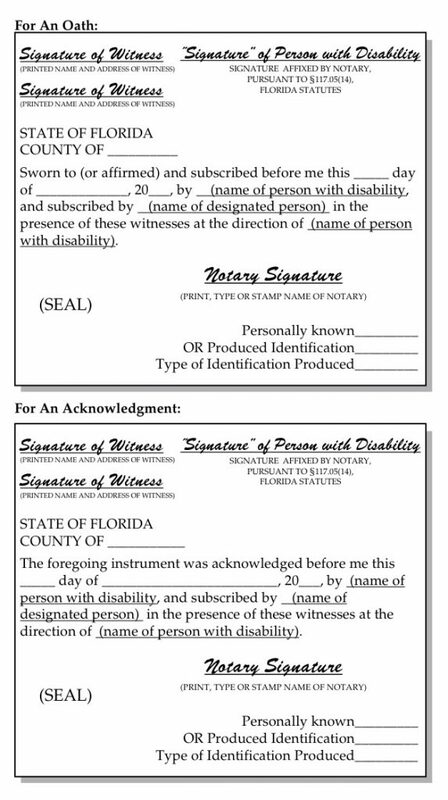 In Florida, an individual with a disability may direct a notary to sign on his or her behalf. In a sense, one person substitutes his hands for the hands of the person with a disability. The notary may notarize this signature and should indicate the unusual circumstances in the notarial certificate. The following guidelines will be exercised by the notary public. ■ Question the person to make sure that he or she understands the nature and effect of the document to be signed. If the person is blind, read the entire document to him or her. If the person does not understand, refer him or her to an attorney for legal advice and do not proceed with the notarization. ■ Ask for proper identification from the person with a disability. It is not necessary to require identification from the designated signer. Think of that person only as the “hands” of the person with a disability. ■ The notary may then sign the signature of the person with a disability at the direction of and in the presence of that person. ■ Perform the appropriate notarial act: administer an oath or take an acknowledgment. The notarial act should be directed to the person with a disability. ■ Complete the notarial certificate with the required information. When stating whose signature is being notarized, it would be best to indicate the special circumstances of the signing. ■ Two persons with no interest in the transaction must witness the signing of the document and the notarization and that their names and addresses be clearly printed below their signatures. Unless otherwise required by law for the particular document, it is not necessary for the witnesses’ signatures to be notarized.